By definition, an APB or All Points Bulletin is released to alert all police officers to be on the lookout for a particularly dangerous criminal. Officers are told to use any means necessary to bring an APB criminal to justice. 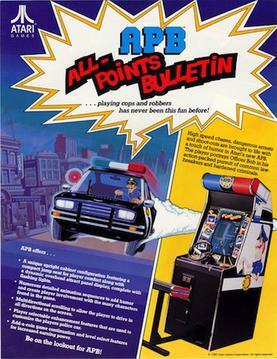 Atari's APB is the ultimate cops and robbers game where the player portrays Officer Bob, driving the police car in hot pursuit of lawbreakers. The levels of game play are measured in days. In order to progress to the next level, the player must arrest a daily quota of lawbreakers or arrest the APB criminal of the day and return to the police station. There are multiple objectives to challenge both novice and experienced players: ① Make the daily quota by arresting the offenders (litterbugs, drunks, dopers, honking taxis, hitchhikers, bikers, speeders and others); ② Send APB criminals to hail (Sid Sniper, Juan Fingers, Freddy Freak, Hans Oop and many more); ③ Collect bonus time, extra fuel and police car enhancements. The game is over when the player obtains too many demerits. Demerits are given for not arresting the day's quota of criminals, shooting innocent vehicles, crashing the police car and running out of gas. Controls consist of a 360-degree steering wheel, a siren button, a fire button and a gas pedal. In order to make an arrest, players must press the siren button and tag the lawbreaker. The fire button can be used to fire upon major criminals after the player has picked up the gun car enhancement from the speed shop. By driving through the speed shop the player can select from several different enhancements for his police car, including: faster acceleration, higher top speed, radar, armor, guns and better brakes. There are many levels of each of these enhancements for the player to acquire. The ability to build a more powerful police car is an added incentive for players to use the add-a-coin game continuation and maintain his vehicle. Players continue to be challenged as they portray Officer Bob through an unlimited number of game play levels. Add-a-coin game continuation and level select features are included for increased earning power. Atari's extensive game options, self-test and game statistics package are included to maximize earning potential.